As part of our ongoing communications around Open Access and Symplectic, we are running a number of drop-in sessions to enable research active staff to ask any questions to representatives from both the Library and RKE teams. What is Open Access (OA) and why is it important to me? Which version of my work do I upload? How do I apply for Gold OA? Categories: Open Access | Tags: Open access | Permalink. See this article on Research Professional regarding Open Access. Big data has recently become a buzz word in biomedical research. Like most buzz words, it is not that well defined and expectations are almost certainly too high, but there is something important happening. This movement is enabled by the massive changes in information technology, allowing storage, handling and analysis of huge amounts of data. It is fuelled by genomic and population studies suggesting that individual genetic and environmental factors influencing health and disease may have very small effect sizes, requiring very large sample sizes to untangle the complexity of their interactions. There is talk of analysing samples from a million individuals, with a full genome sequence and associated phenotypic data from each. Categories: Funder Intelligence and Policy, Uncategorized | Tags: Open access | Permalink. The Open Access agenda continues to represent a big challenge and an important opportunity for the University. Most major funders and some of the larger charitable trusts, already mandate that outputs from their funding must be made freely available and accessible. In order to comply with OA, Manchester Met continues to proudly offer Symplectic Elements research management system. This allows our academic colleagues to record their scholarly output and upload the relevant files to the Institutional Repository, all from one easy to use system. From November 9, all academic colleagues will get a Symplectic link on their Windows PC. To log in, just use your standard MMU ID and password. RKE and Library Services have also been delighted to offer each Research Centre an interactive workshop on Open Access. Categories: Guidance, Training | Tags: Open access | Permalink. In this post, Edward Randviir from the Faculty of Science and Engineering cautions colleagues against a rise in predatory publishing practices as a result of the Open Access agenda. Open Access (OA) is defined as the unrestricted online access to research, and encompasses journal articles, conference proceedings, chapters, monographs, posters, and now datasets. The immediately obvious benefits include enhanced visibility of research and improved chances of author citations, potentially leading to higher societal impact. HEFCE’s Open Access in the post-REF2014 policy states that universities should make any articles and conference proceedings with an ISSN available through an OA route within 3 months of acceptance to be eligible for submission to the next Research Excellence Framework. The University has established Symplectic, as the research information management system that will enable compliance with the OA agenda for staff. A danger with OA is the plague of predatory OA publishers that have emerged in the past five years. A predatory publisher is one that offers OA publishing, for huge nominal fees that are often undisclosed when they invite academics to write for them, often without providing proper editorial and publishing services. This means that final versions appearing online are incorrect, not proofed properly, and in the majority of cases not even peer reviewed – and whether we like it or not, the peer review process improves the quality of published work and filters out the papers that may not be up to scratch. This also extends to conference proceedings. The list does have its critics, but it acts as a safety net for those who are unsure about publishing to an unknown journal. Having encountered a predatory OA publisher called OMICS, I have experienced the unpleasant nature of these companies. I will be happy to assist anybody who is unsure of whether they are dealing with predatory publishers, so please don’t hesitate to contact me. Please don’t make the same mistake I made. Categories: Open Access, Researchers | Tags: Open access, Publishing, Researcher | Permalink. In an article published today for the European GeoSciences Union, Dr Sam Illingworth, Lecturer in Science Communication at MMU, writes an in-depth overview of Open Access. The full article can be read on GeoLog – the European Geosciences Union blog page here. “Access to knowledge is a basic human right.” Yet sadly as scientists we are often forced to operate in a framework in which this is not always the case. This week sees the celebration of the eighth Open Access Week, and whilst there have undoubtedly been many achievements by the Open Access (OA) movement since 2009, there is still a long way to go before mankind’s basic human right to knowledge is restored. So why all the big fuss about OA in the first instance? If you are reading this as a layperson or as a scientist at the outset of their scientific career, then you may be surprised to find out that it costs (often large sums of) money to read online research articles. Even if these fees are not being charged to you personally, the chances are that it is costing your research institution or library thousands of pounds/euros/dollars that could otherwise be spent on research, resources, jobs, or infrastructure (as an example, in 2009, Clemson University in the US, an institute with less than 17,000 students, spent an astonishing $1.3 million on journal subscriptions to the publishing magnate Elsevier alone). 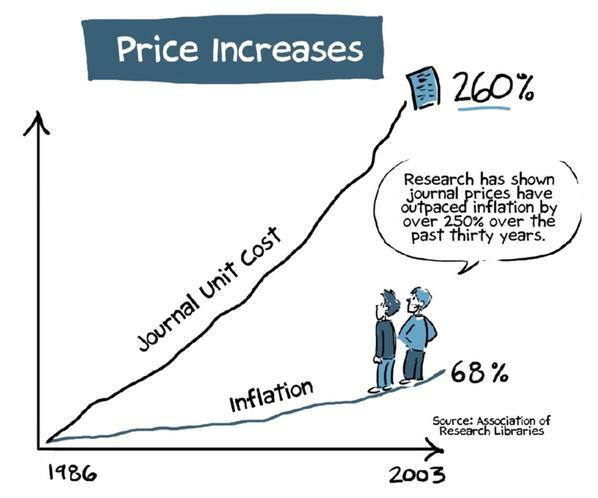 Over the past 30 years, journal prices have out priced inflation by over 250%; but it wasn’t always like this. In the past journals existed for two reasons: as an affordable option for scientists to publish their work in (as opposed to the more expensive option of personally-published books), and as a place where members of the general public and the wider scientific community could find out about the advances in science that their taxes were helping to fund. Sadly, in recent times many journals seem to have lost their way on both counts, hence the need to open it up again. The beginning of the modern OA movement can be traced back to the 4th July 1971, when Michael Hart launched Project Gutenberg, a volunteer effort to digitize and archive cultural works for free. However, it wasn’t until 1989 (and with the advent of the Internet) that the first digital-only, free journals were launched, amongst them Psycoloquy by Stevan Harnad and The Public-Access Computer Systems Review by Charles W. Bailey Jr. Since then, the OA movement has grown considerably, although it is important to note that publishing articles so that they are free for all is itself not without expense. Despite the lack of print and mailing costs, there are still large infrastructure and staffing overheads that need to be taken into consideration, and so rather than make the reader pay, alternatives have to be found. One alternative, known as the Gold route to OA, is to make the author(s) of the article pay for the right to have their research accessible by all. Many journals already require an Article Processing Charge (APC) to be paid before publication, and so some journals have simply elected to add an additional charge if the author wants to make their journal open to the general public. The other main alternative is the Green route to OA, which involves the author placing their journal in a central repository, which is then made available to all. The journal in which the article was originally published will usually enforce an embargo period of a number of months or years that must pass before the published articles can be placed in these repositories, although this can often be circumnavigated by uploading final, ‘accepted for publication’, drafts of the article. You can read more about OA subject repositories in this article. 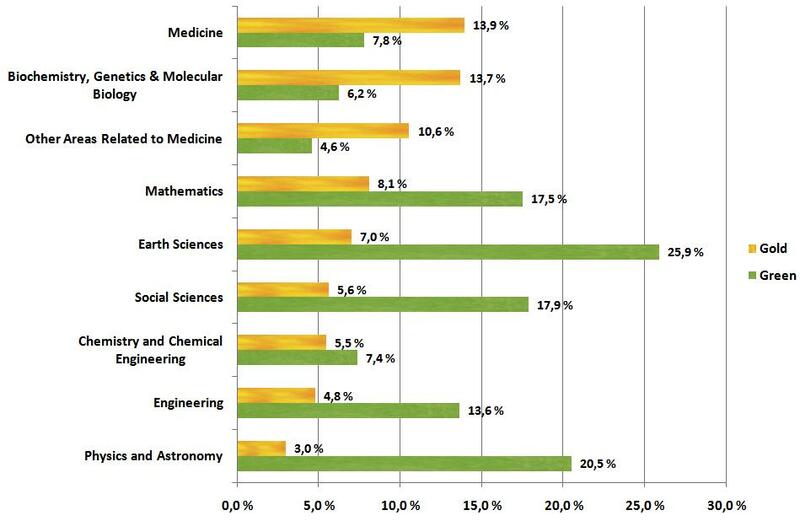 A sea of golden green: the availability of gold and green OA journal articles by scientific discipline in 2009 (Source: Björk, et al.). Both of these approaches to OA have their respective advantages and disadvantages, and normally research intuitions and/or funding bodies guide the route that researchers choose. The Research Councils UK (RCUK), for example, has a policy (which can be found here) that supports both the Gold and the Green routes to OA, though it has a preference for immediate access with the maximum opportunity for reuse. It is worth noting at this point that another key aim of the OA movement is that published research is free to reuse in future studies. This might seem like a fairly trivial point, but currently for any articles published in closed access journals, express permission is needed from the publishers if the results are to be used in any future studies. The major barrier that still needs to be overcome with regards to OA is determining who pays for the right to free access. At the moment many governments have a centralised pot, which they allocate to their different research institutes. However, issues arise when one considers the limitations that this imposes on poorer countries, institutes, research disciplines, and independent researchers. There is also the minefield of determining who gets how much and why; my own institute, Manchester Metropolitan University (MMU) has only been allocated enough funds to pay for 7 academic papers a year via the Gold route to OA. When you consider that some researchers would hope to publish that many papers themselves on a yearly basis, there is clearly a disconnect. It is for these reasons that many are pushing for ‘OA 2.0’, an initiative in which articles are, in the words of EGU’s former executive secretary Arne Richter, “Free to Read, Free to Download and Free to Publish.” However, such an approach will require a major change in the modus operandi of almost all publishing companies. It is worth noting that Copernicus, who are responsible for publishing the majority of EGU’s affiliated journals are very strong proponents of the Open Access movement, and have been one of the leading lights in an otherwise murky world. Top of the food chain: the top 10 UK universities in terms of APC funding distribution (Source: RCUK). The sad truth of the matter is that many of the more traditional journals are now run as big-business, moneymaking machines, safe in the knowledge that they can get away with charging large fees, because scientists are still desperate to publish in places with a ‘high-impact’. However, if enough scientists rise up and move away from these restrictive journals, and migrate towards those with an OA policy, then the impact factors will soon follow suit (in fact, there is already strong evidence that publishing in an OA journal will result in more citations for your research). Only then can we begin to reinstate knowledge as a basic human right available to all, rather than as an expensive luxury dolled out to the privileged few who can afford it. Categories: Impact and Engagement, News | Tags: gold route, green route, Impact, Open access | Permalink.